RETRO KIMMER'S BLOG: MUSCLE CAR CITY! HOT 1960 CHEVYS! MUSCLE CAR CITY! HOT 1960 CHEVYS! As a child, cars played a big part of Rick Treworgy's life. Models, pedal cars, any toy with 4 wheels inspired him. Once he was old enough, Rick began collecting GM cars, Chevys in particular. After nearly 40 years of turning that dream into a reality and stockpiling well over 200 vintage '50s to early '70's muscle cars, he decided to turn this amazing collection into Muscle Car City. 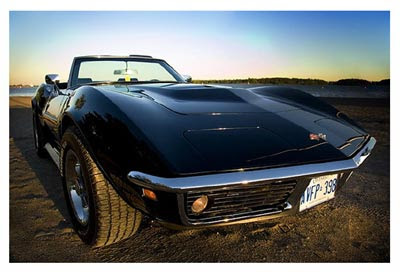 Driving Corvettes and Chevelles played a big part in Kimmer's teen years. I Loved driving a 1969 Cadillac Firemist Blue Vette with 1 to 1 steering, 411 rear end, and the beast 427 engine varooooom. Go ahead and grab that twenty dollar bill off my dashboard honey! A great friend from Flatrock, MI Jim Randolph sent me an email with the fabulous Chevy Car museum located in Punta Gorda, Fl. Couldn't believe how fantastic these cars look! I just want to drive all the red ones! OOH the red Chevelles and GTOs too! Opened the first week of March 2009, Rick Treworgy's Muscle Car City features nearly 200 automobiles of every era dating back to the 1920's. As per its name, the museum's major focus is on the "muscle cars" of the mid 60's to early 70's - the Pontiac GTOs, Chevy Corvettes, Oldsmobile Cutlass 442s, Chevelles, Camaros and high-horsepower Impalas that revved up the imaginations of teens and young adults all over America. The museum includes a 60's diner themed cafe as well as a memorabilia gift shop carrying everything from T-shirts, posters and jewelry to neon signs and gas pumps. Children under 12 free with adult. Please call 941-575-5959 for more information. Muscle Car City is located at 3811 Tamiami Trail, Punta Gorda, FL 33950. What once was a Wal-Mart is now a '60 era Diner, Memorabilia Store, complete Speed Shop and 99,000 sq. ft. of 180+ GM Muscle Car collection. Since it opened Tuesday, March 3rd 2009, it has become a favorite hangout of everyone that has a love for the automobile. This blog will keep you informed on the many activities at Muscle Car City. Between blogs go to www.musclecarcity.net or call 941 575-5959. You can email Tony at tony@musclecarcity.net. JOHN NORMAN COLLINS: KELLY AND CO.